Cabbage is a low-calorie, fibre-rich, leafy vegetable that boasts plenty of health benefits, which include: treatment for constipation, headaches, obesity, arthritis, and vitamin C deficiency. An unsung hero of the vegetable crisper, this versatile veggie can be used in everything from slaws and salads, to fermented foods like sauerkraut and kimchi, to soups and stews and Indian curries. 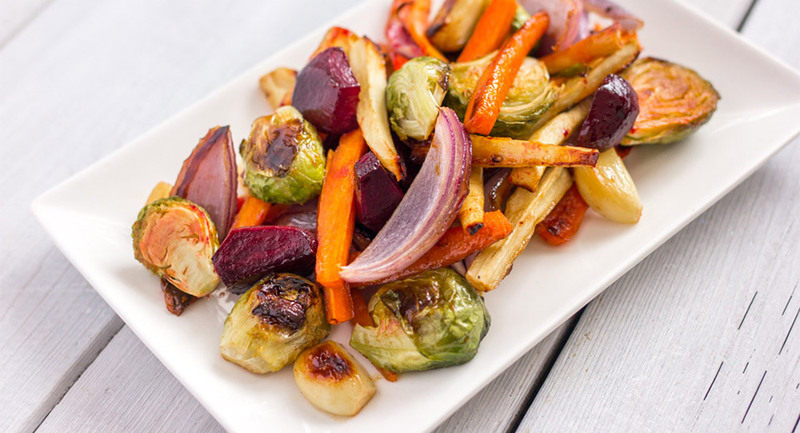 Cabbage comes in a variety of kinds – green, red, Savoy and Napa. Green and red cabbages are identical with the exception of their colour. Both are quite heavy for their size due to their density and are smooth and spherical in shape. Savoy cabbage has crinkly and flexible green leaves that are looser than a green or red cabbage. Savoy is also milder in flavour (with the exception of the stems, which are slightly bitter) and very tender. Napa cabbage is long with oblong leaves and pale green in colour and tastes milder than green cabbage and is common in Asian cuisine. Select a cabbage that is heavy for its size with good colour and nice crisp leaves. Avoid cabbages that have brown and/or blemished spots, or loose or yellow leaves. 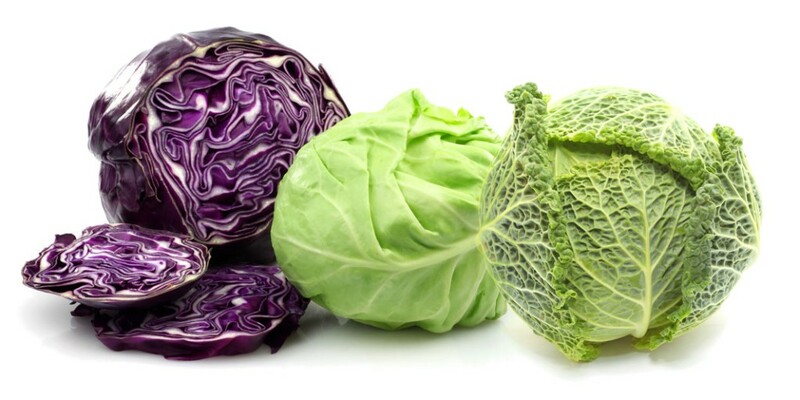 Cabbage can be stored unwashed in a plastic bag in your refrigerator for up to two weeks. However, Napa cabbage has a shorter shelf life and will only last approximately four days. Cabbage can be a part of many healthy meals, from crunchy coleslaw to one of the best comfort foods of all times – cabbage rolls. To prepare your cabbage, first remove the outer leaves and run it under cold water. 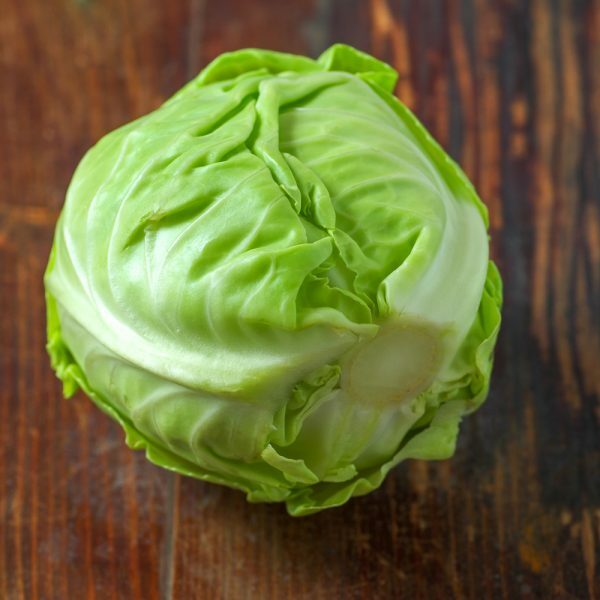 To core the cabbage, use a small sharp knife and cut a cone shaped section from the bottom of the cabbage. Or, you can cut the cabbage into quarters starting at the stem end. Be sure to cut the core out of each piece. You can also freeze cabbage for future use. Start by first chopping it into slices or chunks, depending on how you choose to use it in your recipes. Blanch cabbage for about a minute or two in boiling water, then drain and submerse into an ice bath to shock the cabbage and stop the cooking process. Spread the leaves or pieces out and pat dry. Transfer to a baking sheet to flash freeze, and then place in an airtight container and use within 9 months. Important to note: One pound of cabbage will yield approximately four cups of shredded raw cabbage or two cups cooked cabbage. Red cabbage tends to turn pale blue when cooked so if you want it to retain its vibrant purple colour, add a little vinegar or lemon juice (or something slightly acidic like apples or wine). 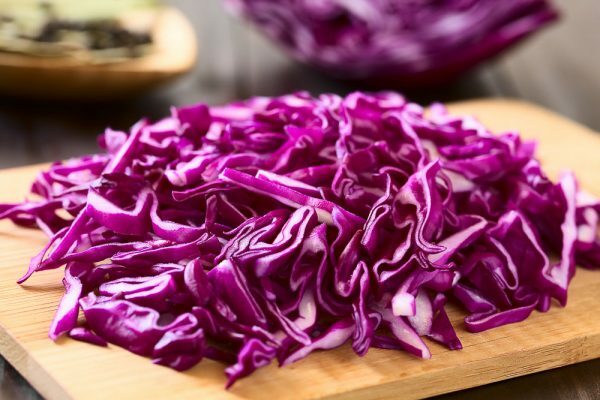 Shredded cabbage is a great addition to any salad, soup or stir-fry and cooked shredded cabbage is a terrific filling in wraps and casseroles. Try cooking cabbage until it’s just tender. This way it will retain its sweetness and crunch. 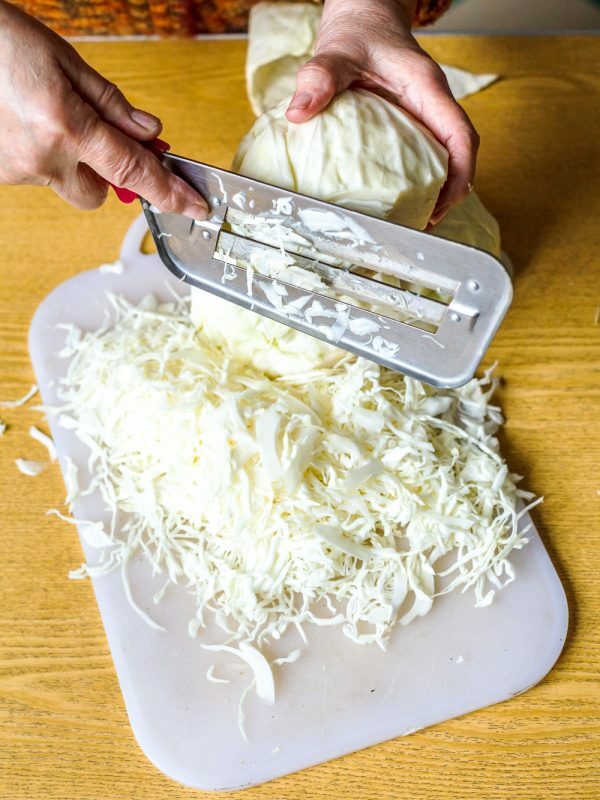 If you find it difficult to slice cabbage thinly, try peeling a few leaves off the head of the cabbage and stacking them on your cutting board. This makes it much easier to finely slice to your desired thickness. Said to aid digestion, fermented foods including sauerkraut made from cabbage are on trend. It’s also very easy to do yourself at home. 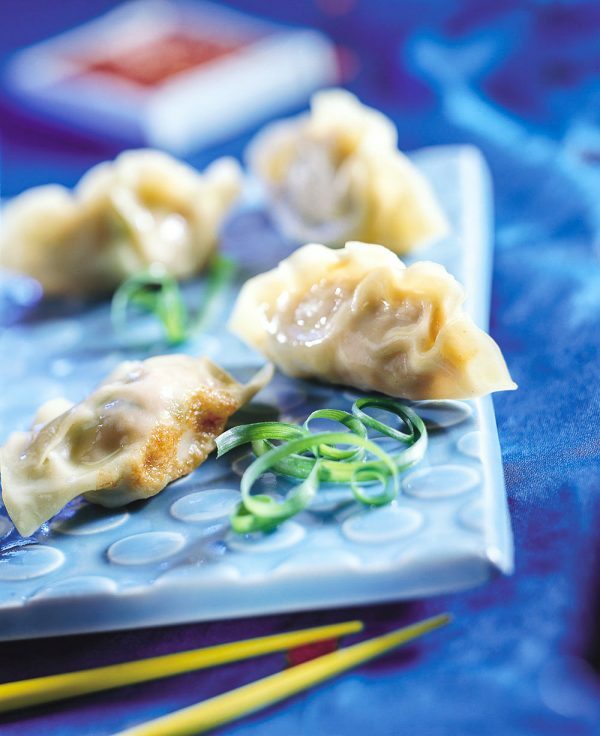 This recipe is a good starting point for those who would like to give it a go. Speaking of foods that are on trend, Kimchi, another fermented cabbage-based side dish, is having a much–deserved moment and can also be made at home. Cabbage is one of Canada’s heritage foods. 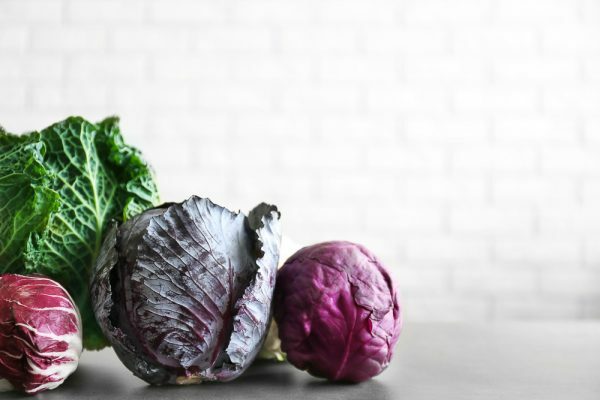 A versatile veggie that grows and stores well, this Globe & Mail article shares why we should all embrace the humble cabbage. Cabbage always makes a welcome crunchy addition to salads. 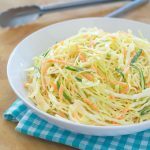 When shredded, it’s obviously an integral ingredient to any delicious slaw, but can also be delicious when served with root vegetables like beets, carrots, or parsnip. For example, our Tangy Thai Coleslaw using Ontario grown cabbage or our traditional Creamy Coleslaw recipe are excellent starting points for adding this seasonal vegetable to your diet. Cabbage has a wonderful “melted” texture when added to soups, and develops a subtle sweetness when cooked through. Consider adding cabbage to your favourite casserole or soup. The leaves of a red cabbage make a striking statement when used as a “bowl” to hold quinoa and other Mexican-inspired ingredients in these Tangy Quinoa Spring Salad Cups. Another must-make recipe is cabbage rolls, which have been given a modern makeover in this Crock Pot stuffed cabbage roll recipe. Cabbage as a condiment? You’ll say, “Yes please” after you try this duo of cabbage and cranberries from Half Your Plate and Chef Michael Smith. 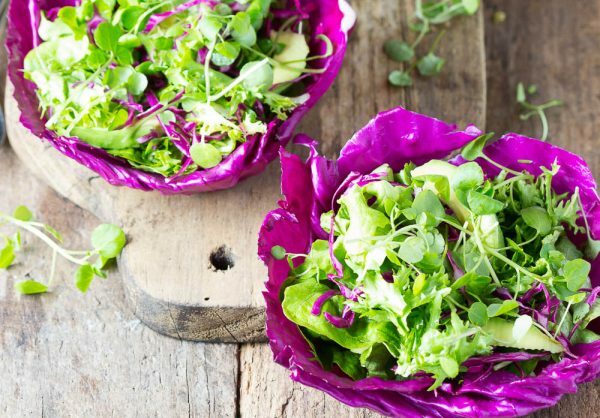 For more inspiration, this list of 20 versatile recipes proves that cabbage is indeed king. Cabbage is full of goodness! 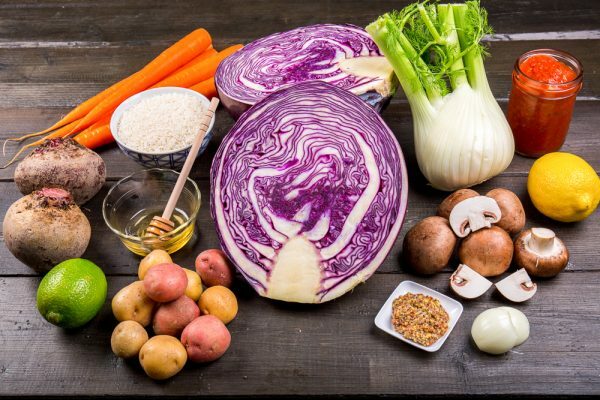 According to the Canadian Nutrient File, 100 g of raw cabbage contains the following amounts (according to the daily requirements of the Canadian food guide): 100% of vitamin C, 95% of vitamin K, 7% of fibre (1.8 g), 5% of magnesium, 5% of potassium, 4% of calcium, 3% of iron, and 42 µg of beta-carotene.